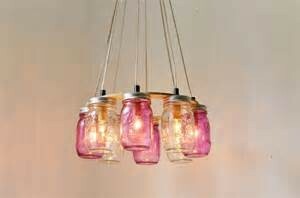 Let’s talk Mason Jar Lighting Projects. Whenever you finish a wine bottle, go to recycle a jam jar or throw out any interesting looking glass bottle, remember all the endless possibilities that one empty bottle has to offer. Find a nice safe place to store away these unique empty bottles and you will be happy you saved them for a rainy day occasion. 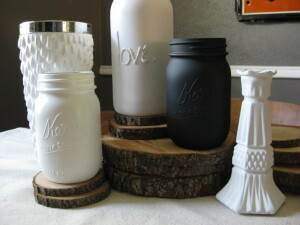 Today we are going to explain a few different ways in which you can utilize these once empty bottles and turn those bottles into a trendy, unique way to light your home! Rainy days aren’t always the end of the world, some times it’s nice to be in your own home relaxing, especially when it comes time to wip out the arts and crafts! 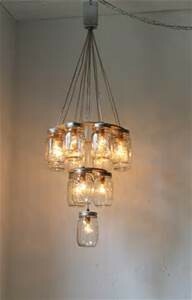 Mason Jar Chandelier: Simply attach one piece of solid wood to the ceiling of your kitchen, living room ect and hang the mason jar lanterns from it. There are several different looks to this rustic design concept. 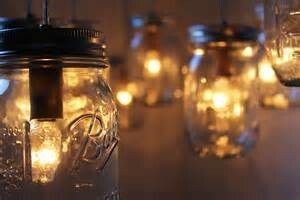 Just Simply fill the mason jar with some gravel and or pebbles and place a candle inside the jar. 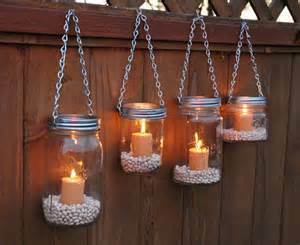 Hang the jars with metal chains and you get a great decorative lighting for your yard. 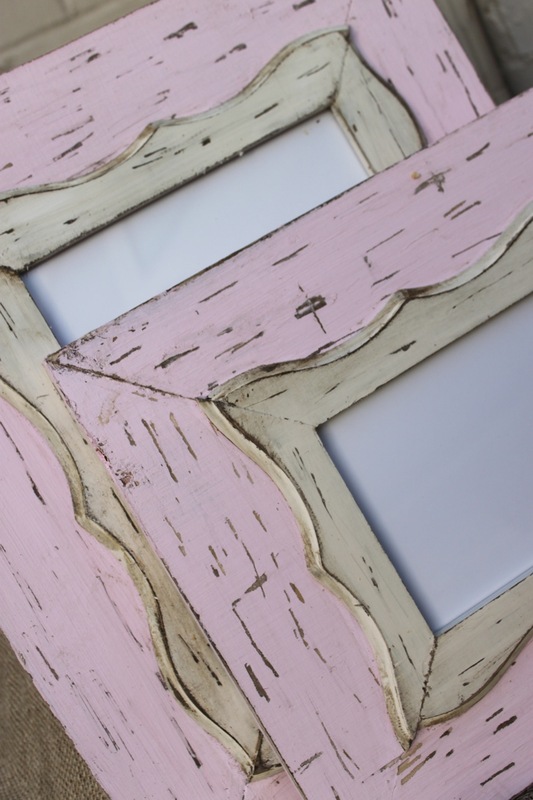 Affordable Shabby Chic Design Projects You Can do at Home! 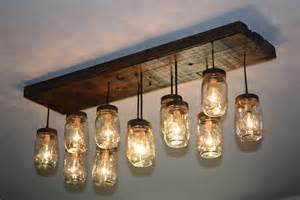 You don’t need to be an expert on furniture design or interior decorating to create these fabulous at home, Shabby Chic creations. All you need is some paint, wood, glaze and some paint! 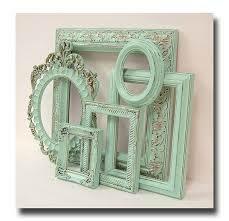 The possibilities are endless, but today we are going to focus on transforming your old, worn out tired frames into shabby chic perfection! 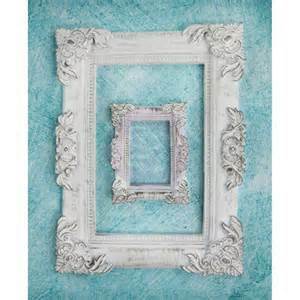 You can either use a frame you already own, or search for a good (wooden) frame at your local craft store, garage sale or flea market. 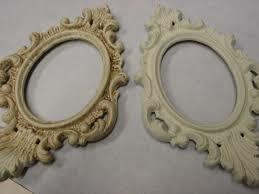 The beauty of Shabby Chic refinishing is the age of the mirror frame doesn’t matter because once you paint it properly with an antiquing glaze, it will feature that aged, shabby chic look. 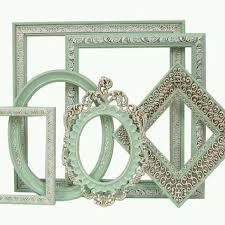 When choosing your paint color you must choose an Oil Based Paint. If you are confused, do not be afraid to ask a store professional whether or not the paint you have chosen would work well for a Shabby Chic Project. The advantages of oil based paint are that they are generally more durable than acrylics, cover stains better and if a gloss finish is needed, offer a lovely gloss over it’s acrylic counterpart. The disadvantages are long drying times, smelly solvents in the paint and harsh chemicals needed to clean brushes. Don’t Forget to Protect that floor with newspaper! Get Started painting! After, Allow paint to dry completely to the touch – about 25 minutes depending on the paint. 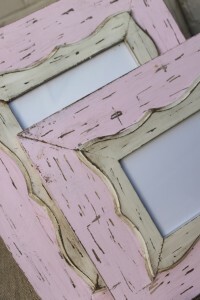 Before you apply the second coat of paint, rub some candle wax on the frame. Essentially, we want to is to expose corners and edges because these are the places that would normally see heavy wear and tear over the years. You can rub in other spot as well to give it a really authentic beat up look. 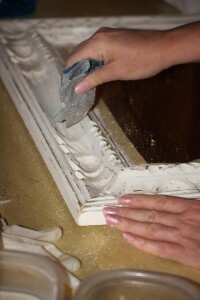 The reason for using candle wax is to prevent the second coat from sticking to the first. Some people use also use paper cement which works good too. Wait until the paint is dry. Then, the fun starts! Take that sand paper and fold it to form a sharp edge. Start scraping away at the spots where you put the candle wax. Once you see the other color coming through – stop. You don’t want to scratch the color off. Scratch as much as you want the other color to be exposed. When you are satisfied with the look you might want to lightly rub with fine sand paper just to get rid of any loose pieces of paint if there are any. To keep paint from scratching during use, Make sure you throw a coat of water based minwax polycrylic protective finish (clear satin) on it. It will seal the paint and give it a matte look. And there you have it, a sunday project well spent!